Art theory has always had a major component in writing, or the illustration of the artists’ own ideas around their trajectory and working methods. To be more specific, writing has been a way for artists to ponder on their own activity, to identify certain trends they felt close to, to articulate a reflection on a given medium and challenge preconceived ideas. Just as Film theory incorporated writings, manifestoes and reflections by filmmakers – in addition to those by the critics who undertook the study of the “new [cinematic] object” -, this publication testifies to the intention of gathering together a number of artists writings in order to review the early days of video art (up until 1990, to set a time span that is not entirely arbitrary). 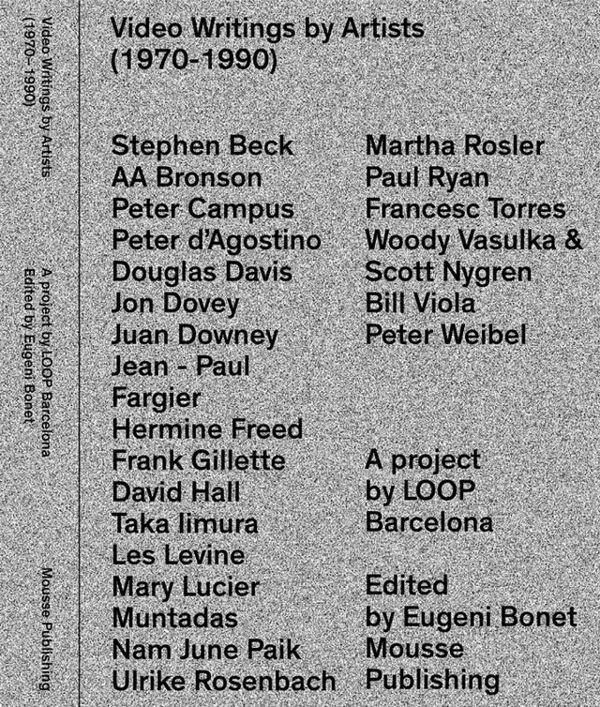 A reference book that would collect a series of texts that are currently scattered in different publications, and add a critical layer to LOOP Barcelona’s 15th edition (Winding the Clock Back – A contemporary archaeology of video).